I always found that trust is one of the hardest parts of faith. 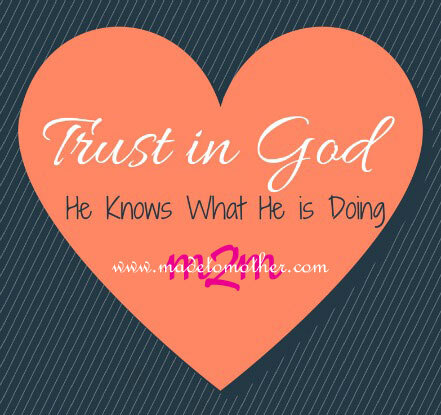 To have faith in God means to trust that He knows what He is doing. It means when things happen in your life that are not easy to deal with and you feel like you can’t take anymore, believe that God knows what He is doing and He has a plan for you. This took me a very long time to realize. Growing up was a long, hard process for me. I had a lot downs, and never really felt that I had too many ups. My parents divorced when I was around six years old. I have some slight memories of my parents being together growing up, but the hardest memory I have is the day my dad left. I remember how sad he was, and how confused I felt. Things changed that day; my life took a turn that I would never be able to come back from. My path was set. Little did I know that this was part of the path that God had set out for me. All I knew at that time was that my dad was no longer going live with us. Up until then I was a total daddy’s girl and this daddy’s girl started having some huge anger issues that day, most of which I took out on my mom. She was home and my dad wasn’t so who else would get the brunt of my confused angst? I didn’t realize then how hard things were for my mother. She was a single mom, with two girls. She thought she had it all planned and now she had to start over again. None of this was able sink in for me; I was too young to notice. I also was too young to know or understand why my parents got divorced. It wasn’t until I was about thirteen that I realized at least part of what happened. I was talking with my best friend about my dad and stepmom, and how quickly they had gotten together. The realization that my dad had cheated on my mother cut through me like a knife. It was devastating for me. The first thing I did when I got home was confront my mother with my suspicions and very calmly and rationally she confirmed them. She was not bitter, or at least she did not show it if she was. From my view of things my parents had one of the most amicable divorces that I have ever seen. Neither one spoke badly of the other, at least not to me. Considering the truth behind the divorce, it was extremely cordial. My mom even got along with my dad’s mom, father and sister really well afterwards. Of course, I found out years later that it was because my grandmother had laid a hard and fast rule that when they were in her house they needed to keep her grandchildren in mind and there was to be no fighting. No one ever questioned Mem’re; her word was law. The final realization of what happened allowed me to better understand my feelings towards my stepmother. I’m not saying they were deserved; I was mean and distant. However I now understood why those feelings were inside of me. Part of me realized that things had changed when my stepmother came into my life. It would still take a long time before I would let myself forgive her or my dad for what happened. It was also awhile before I realized that the cheating was not the only reason behind the divorce, I realized that there was something fundamental wrong with my parent’s relationship. It’s been well over twenty years now and my dad and stepmom are still married; obviously something works there that didn’t work between my mom and dad. One day, finally, my mother did fall in love again. However, to say that I didn’t get along with my stepfather would be the understatement of the century. We butted heads terribly. Explosive tempers, teen angst, the works. My stepfather was not a perfect man; he had his issues, however I have to finally admit (and agree with my mom) that I took a lot of my anger that I had for my father out on my stepdad. I have a huge apology to offer him; one that is all too long overdue. The sad part is I cannot say it to him in person, not until I meet him in heaven, as he passed away when I was nineteen. I wish we had been on better terms when he died and it grieves me to this day that I allowed things to end like that between us. I tell you this not to make you feel sad for me, because there is no reason to; not anymore. I tell you this because through all of the heartache God had a plan for me. These things that happened to me and my family paved a path for all of us. I cannot change that. I wouldn’t want to. My mother was able to find love again after my father. And although I wish she was able to keep that love a little longer, God made sure she was not alone when this happened by giving her another baby girl with my stepdad. And now, at twenty, my sister is one of the most beautiful people I know. Without my parents’ divorce the world would not only be short of her but also my brother from my dad and stepmother. We are a blended family, but I wouldn’t have it any other way. That rocky, hard road I was on in my early, young life took me past a lot of angst, but eventually I found God on it again. Of course He was there with me the whole time; He was just waiting for me to catch up. When I finally did, He made sure to remind me that if things did not turn out the way they had, I would not have been in the right place at the right time to meet my husband. And if I didn’t meet him, I wouldn’t have the two beautiful daughters I have today. There is plenty more road to go, and I’m ready for the bumps, and I thank God for them every day. God really does know what He is doing. We don’t have to like it or even understand it; we just have to trust in Him. That’s easier for me now. And if it isn’t already, I pray that it can get easier for you too. 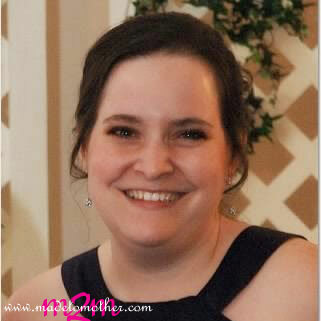 Nikki is from New England where she shares her life with her husband and their two daughters. Outside of her family and God, writing is her passion. She shares this love through her blog, Growing Up Mom where her mission is to keep it simple and easy, and always continue to grow. I love your bravery in sharing your story here. I know that I am blessed by hearing your story because you are sharing from your heart. I have also found that there is a lot of healing when you can put words to all the feelings that were with you as you grew up. Blessed to have you link up at The Weekend Brew. Nikki, thank you for sharing your story. It is beautiful the way God brought you through so much confusion and pain. I admire your obedience to write about it all and I can just imagine the people you uplift in doing so. Thank you for your kind words, I really appreciate the love and support. I am truly blessed, and luckily I can see that all the more clearly now that I am a parent myself. It’s funny how your perspective changes as you grow up, and how your trials become lessons for your children. Hopefully, I can share more and more with my girls as they grow up, but not too fast! Wow. You have learned so many important issues at a young age. I think I am finally getting it. I can look at my life and say, “Trust in God, He knows What He is Doing.” I really found alot of inspiration in this post today. Thanks for sharing. Thank you, it took a long time to come to this, believe me. I was lost and confused for a long time, but luckily now I know I was never really alone. It takes us a lot of growing up to understand perceived bad things that happened to us in childhood. Our anger toward others who we blame for our pain is often because we are mad at God. I am glad your mom was able to fall in love again, and sorry your step-dad died before you could appreciate him. Your grandmother was a good woman to keep the peace. Thank you for sharing with us at Tell me a Story. Thank you, I was lucky to have my Memere in my life, and also lucky to still have my other grandmother too! These are two strong women that I can only pray to be like as I grow older and hopefully a lot wiser too. At one of the lowest points in this struggle my other grandmother took me to live with her for almost my entire senior year, God knew that I needed to step away from my house and what I was putting myself through, and gave this to me in two wonderful women. i really enjoyed this heartfelt post. Thank you so much for sharing! I have come to similar realizations through the years. And my path has never quite been what I expected. It grows you, doesn’t it? It certainly does, and my husband and I have both come the realization that we make mistakes in our lives, and grow for them, so that our children don’t have to. From our experience we can change the course of our children’s lives for the better. Rather my pain than theirs, maybe that’s why it took us 6 years to get married and another year from there to begin our family. I wanted to make sure it was right, and then figured, I would give it time to make even more sure! We met when we were 21 and started dating immediately, then we married at 27, and had our first child at 29. 13 years later we are still going strong. My parents divorce was hard on me, but it showed me that I did not have to rush love, and so I took my time, and then some! Divorce is hard on everyone and the circumstances surrounding them don’t make it any easier. I have a similar story, Nikki, times 3. Sigh…… but God’s word promises that it all works for the good for those who love God. The brokenness I carried about my ‘father issues’ was healed by my Heavenly Father when I was 40….and He’s still working on me. Thank you for linking up with The Small Wonder Community. Thank you, I really appreciate it. I am still working on my father issues, but at the very least I am no longer angry. Now, I just need to figure out how to re-build the divide. Thank you for sharing this story. Praise God that He alone is completely trustworthy and that we can always depend on Him. Linked up with you at Small Wonders — hope you’ll stop by for a visit! Hi – I’m your neighbour from Wedded Wednesday. What a courageous step, to tell this story. I think you have helped a lot of people today. I commend you for sharing your story here in this public way! Although my situation is different than yours, I understand the pain of divorce. My parents divorced when I was 18. Many people seemed to think it would be easier on me because I was older…but it was really, really hard! Your message here is a good one…everything that happens to us in this life is all part of God’s glorious plan, even if it doesn’t seem glorious at the time. Thank you, it really doesn’t matter how old you are, divorce hurts because it changes a family in ways that are hard for anyone else to understand. We just have to remember that God is there for us, especially in these times. I just wish I had realized it more when I was younger. Always trust in Him for He has a plan for you. It was something I had to remind myself amidst the civil war in my home country. And here I am, a living proof that He does know what He is doing. I commend you for sharing your feelings openly! Thanks for linking up at Thursday Favorite Things. Can’t wait to see what you’ll share next week! Oh how lovely. Isn’t it amazing how in the moment nothing makes sense but as we trust in God we come out feeling like we are better people and more Christ-like for it. Thank you for sharing your story with us and thanks for linking up to the #SHINEbloghop. I saw the heart and the message within and thought wowcthis is a good idea for a poster at my upcoming weekend TEC retreat. I copied the picture to my tablet then began to read the story that resembled my life and well because as much as this was Nikki’s story, I am the mom in the background. I am so proud of the beautiful young lady, wife and mother you have become. I am happy your road to discovery led you back to God and you realize that no matter what we’ve been through in the end it was worth it becasue that broken led you to Dana, blessed you with 2 beautiful childr e n, enriche x my life as their grandmother. I Love You!! Thank you Mom I love you too! I am a better mom because of what I saw you go through, so I have you to thank for that. God really does know what he is doing. Thank you for stopping by for sharing your piece in this story! What a joy it has been for me to feature your daughter and your story here. What a beautiful testimony of God’s providence. Thank you for sharing with us. I have had so many prayers I thought went unanswered only to learn later that He had a plan all along. Found you over at Equipping Godly Women. Looking forward to seeing more of your story. Thank you Hope, I am glad to see that you found your answers in his “non answer”. Isn’t that always the way? In so many ways, even with some of the heartache I have had to face, I know that my life was never as bad as it felt at the time. I pray that I can help my children see God’s work in their life sooner rather than later. As I say to my husband, our growth helps us grow our children. We never really do stop growing up, and I am still finding new lessons every day.